The village was looking particularly Autumnal when Elias and I took a walk a few days ago, so I decided it was time for me and Dan to indulge in some delicious comfort food. I came home and prepared a warming Cumberland Sausage casserole in the slow cooker, with a side of mashed potatoes and tender stem broccoli, and then set to dessert... but I couldn't decide what to make. Dan has always loved 'old man desserts' as we call them (that's traditional English desserts to normal people) - especially apple crumble. I never really liked apple crumble until I met him but I have grown to love it so I decided to I wanted to make an extra special one, and when I came across this recipe on the cookfood blog I knew it was the one for me! I've adapted the recipe just slightly from the one featured on their blog - but it'll be delicious either way. My adaptation made enough for a rather generous portion for each of us but you can adjust it as you need. - Preheat your oven to 170Fan/ 190Electric/Gas mark 5. - Start by preparing the apple(s). Peel, core and chop them however you prefer. I like it in small chunks but some prefer it in slices. Place in a bowl and put aside. - For the filling, place your sugar butter and double cream into a saucepan and heat gently until combined - keep stirring your mix until all of the sugar has dissolved and butter has melted and then take it off of the heat. Try hard to resist tasting, as it could be very hot! - Carefully pour your toffee sauce into your baking dish and then top with the apple pieces. Put this to one side whilst you make the crumble topping. - Start by cutting the butter into small cubes and add into a bowl the the flour and cinnamon. You can then 'rub' the mixture between your fingers and thumb until it resembles breadcrumbs (or crumble!). Once the butter has completely combined you can go ahead and add in the sugar. Mix this well. - Evenly sprinkle the crumble topping onto your apples and pop into the oven. Bake for 30-35 minutes. Serve your crumble warm and fresh! For some extra indulgence add a scoop of vanilla bean ice cream on top! This dessert is amazing on those crisp autumn days and is so easy to make! What's your favourite Autumn dessert? 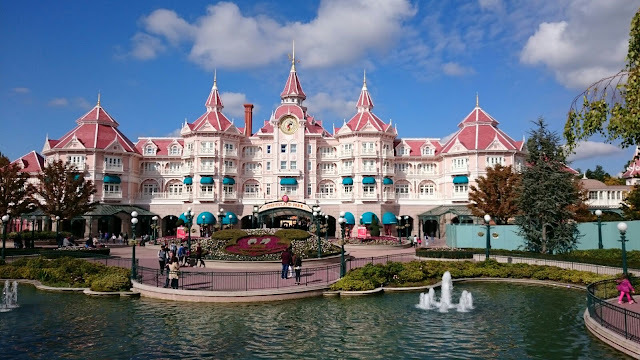 As many of you know Dan and I recently got married and we went on a little mini-moon to Disneyland Paris!I have ALWAYS wanted to go to Disney and if you are a follower of my Instagram feed, you've probably already seen that it was everything I dreamed and that I never wanted to leave! 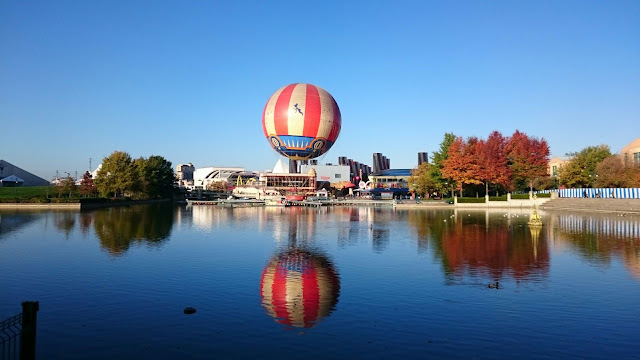 I've decided to break up my travel posts a little as there is a lot to say about our stay at Disney, and I don't want to keep you too long! Today I'm focusing on our hotel and the surrounding area! We flew from Gatwick airport and after a short 45 minute flight (and a few glasses of Prosecco) we landed in Charles De Gaulle airport in Paris - which was the hugest, most confusing airport I have ever had the displeasure to visit. Nonetheless, we found our way to the Disney magic shuttle stop and boarded for our last leg of the journey to Disneyland! 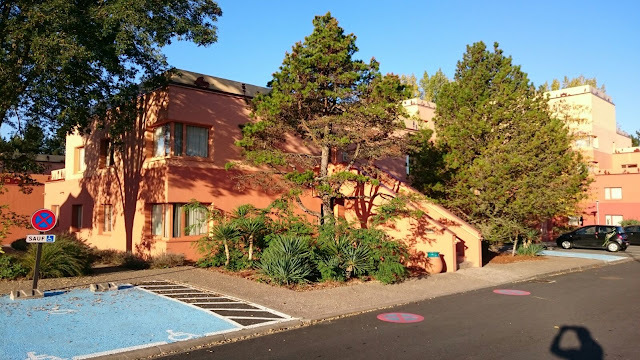 We stayed in the adorable Santa Fe Disney hotel which has a 'Cars' theme and is just a 10 minute walk from the Disney parks. The hotel we stayed at wasn't really important to us when booking as we knew we would be spending all of our time in the parks and the Disney village, but when we arrived I couldn't have been more pleased with our selection, everything in the hotel was thought of and was just so fun; The breakfast was served out of an old pickup truck, the rooms were named after 'Cars' characters, the entrance was decorated with Mexican inspiration and the pathways were painted as if they were roads! The hotel offered a 24 hour staffed reception, a free luggage hold room for your day of check out, a mini arcade, a gift shop, a bar, restaurant ('La Cantina') and payphones amongst other things so you really are covered for everything. We opted for a standard room, which consisted of 2 double beds and a bathroom with shower and bath. The room was cosy but perfect and even had a TV for those rare downtime moments. I loved the way that the 'Cars' theme continued to the decor of the room. There were traffic cone lamps above the bed and on the dresser, 'Cars' artwork adorned the walls and even the shower curtain was decorated like a checkered flag. I absolutely fell in love with the bathroom mirror and wanted to bring it home! There were towels and adorable Mickey Mouse amenities in the bathroom and our room was cleaned each day of our stay which was just lovely. The beds were super comfy (especially after a long day theme-parking) and the hotel was super quiet too - I don't think I heard a sound on any of our nights there. Something else I noticed was that there were rooms on ground floor terraces as well as the first floor ones, so I would say that this was an appropriate hotel for wheelchair users and for those who find stairs a little difficult. Breakfast was included as part of our package and when we arrived for check in we were asked which breakfast slot we would like (7am,8am,9am). We chose 7am as we wanted to eat breakfast and head off to the parks so we could really make the most of our holiday. We planned to get up and dressed at 6am, head off for breakfast and then walk straight to the parks (all guests staying the Disney hotels are welcomed into the park at 8am rather than its usual 10am opening time), but as it turns out, we were soooo tired from our first day in the park that we slept through the alarm and didn't wake up until 6:45 - so we rushed off for breakfast and got ready after! Breakfast was served as an all you can eat buffet style and although Dan was disappointed with the lack of hot breakfasts, I found the selection to be quite impressive and exactly what you needed before a busy day. Of course, it wouldn't be France without croissants and pain au chocolate a plenty, but there was also choices of cereals, fruits, cheeses and breads. Drinks were also difficult to choose from as there were coffees, teas, hot chocolates and juices. I practically lived on hot chocolates during our stay as not only was the weather so cold, but they were also so delicious. I loved the way in which the breakfast room was presented and how it was so relaxed. On our first morning we were first in queue for breakfast even though we had woken up late and on our second morning we only had to queue for about 10 minutes to be let in and we still found a table with ease! The dining room was kept in theme with the 'Cars' idea and foods were presented on the back of a pickup truck and there were gas pumps and other car pieces placed around. It was such fun! There is a shuttle bus which takes you from the Sante Fe hotel reception right to the doors of Disneyland at no extra cost, but as the weather was so beautiful (yet cold! ), we chose to walk there instead. There was a back road which took you along a river filled with the biggest koi carp and surrounded by stunning views. There are plenty of signs around to point you in the right direction and we arrived at Disney in no more than 15 minutes! The feeling you get when you come up the steps and see the Disney balloon is just incredible - magical, even! You can stroll right through the Disney village and grab a Starbucks on the way and you can also shop a little, too! I really enjoyed the surrounding area to our hotel. Maybe its because the Autumn air had started to turn the leaves those fiery colours, or all of the well thought out and placed memorabilia, or the fact that everyone you pass is so happy and friendly, but it certainly made our stay that bit more special and memorable - just take a look at my pictures! I also liked the fact that there was a garage right next door to this hotel as it meant we were able to pick up a few snacks and drinks to keep in our room for when we arrived back in the evening! I wouldn't hesitate to choose Disneys Santa Fe hotel should we visit again, it catered for everyone and the staff couldn't have been nicer! I hope this has been a fun read for you guys - or maybe its convinced you to have a little trip to Disney? I am desperate to go again - I'm already saving up to take Elias for his 5th Birthday! I had been wanting to update our kitchen for some time. It was nice, don't get me wrong, but I felt like it needed a bit of new life to be breathed into it. so this weekend Dan and I went shopping and chose some lovely pieces to revamp it with! I love to decorate the home, it really makes it feel like your own when you put your personal stamp on it and I was really taken by a copper and black theme and, luckily, Dan agreed! So we set out on our shopping trip, and we ended up finding some perfect pieces! Dan loves to drink coffee, but I don't, so this Copper effect Cafetiere is perfect as its just the right size for one (large!) cup of coffee! Although I'm not a coffee lover myself, I do love the smell of Dans Vanilla coffee brewing in the morning. I loathe having papers lying around everywhere so this copper letter rack was the perfect solution! It's neat and tidy and matches with the theme, so we had to have it! Our old kettle had an exploding incident recently, so it was really time to get a new one and I was taken by this pyramid kettle and 4 slice toaster set - they were absolute bargains and look so lovely on our worktops! This salt and pepper set is just perfect and fits in so well with the theme, they look lovely alongside our new copper effect canisters! I like to have utensils hanging up under our cabinets and this copper ladle, slotted spoon, spoon and masher look fantastic on display. We decided to get a new dinner set and mugs to match the theme and these black ones are so cool, Dan has always wanted black crockery and I finally agree with him that they are actually, very stylish! 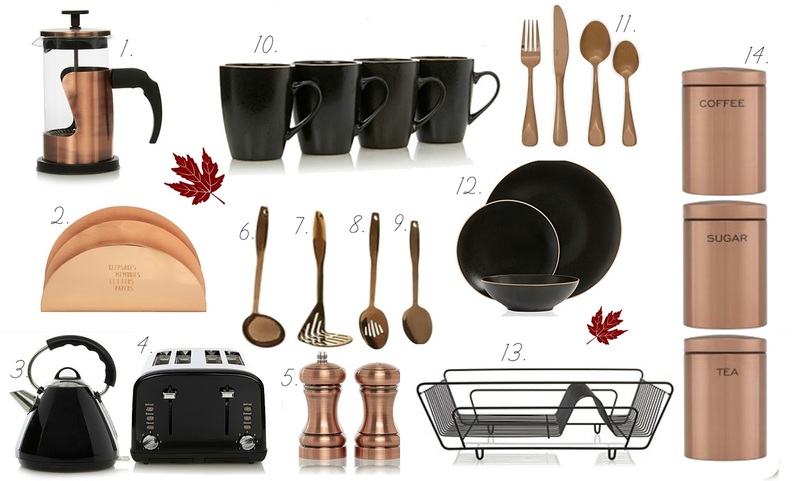 To go with the new crockery set we had to have new cutlery, and these copper effect ones are perfect! We were kindly given a £30 Next giftcard for a wedding gift so we only ended up paying £2 for them! And to keep things neat and tidy around the sink, we decided to invest in this black drainer too! We also picked up a new black washing machine in the Argos sale for £179, and I cant wait for it to be delivered and installed! I am so pleased with how everything looks, its so refreshing to have some new pieces in the home and it all looks very warm and stylish. Now my mind is wandering to how we could bring some new life to our bedroom! Although Dan isn't much of a fan of seasonal homeware, I really love this orange check bedset, it looks so warm and cosy and I know that it would bring some much needed colour to our room. Finished off with a few of these chocolate cord cushions and this orange fleecey throw I think it would look gorgeous and so inviting! I also thought these copper filament lamps would look amazing on our nightstands as they would really make a feature piece - the only trouble is that the filament bulbs aren't included and they can be quite pricey! 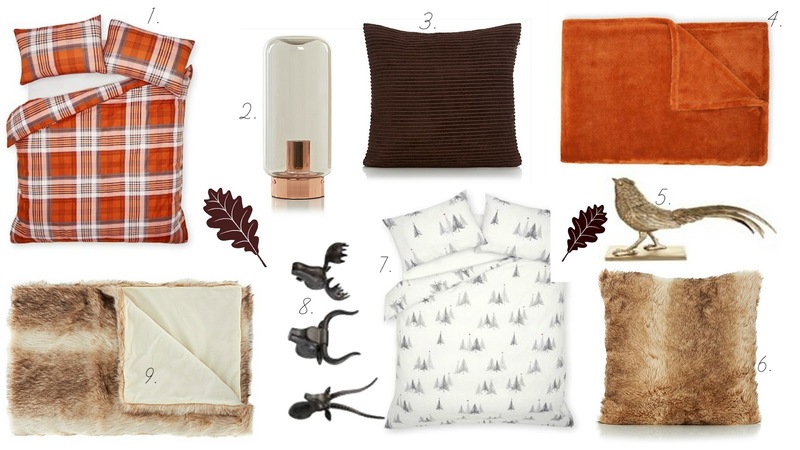 For a more natural and neutral look, I am loving this scattered tree bedset, I think it would look amazing when paired with these Wolf faux fur cushions and throw! I would never want to get out of my bed! To decorate the room I love these mini animal heads! Our bedroom is up in the roof of the house so we dont have a lot of wall space, and I think the miniature size of these heads would work well to our advantage! I also think this golden pheasant ornament would look stunning on the windowsill - just look at its tail feathers! What is your dream home style? Its no secret that I love Halloween. And I'm not afraid to admit that I'm a sucker for anything with a Halloween label slapped on it, so when I was in LUSH recently and I spotted their spooky collection, I knew I had to pick something out. We don't have a bath at home so bath bombs and fizzers are not an option, but one of the friendly staff suggested the new Nightwing shower jelly to me! I always enjoy using LUSH products as I know that they do not test on animals and they use natural ingredients which are safe and great for even the most sensitive skin! I was initially drawn to Nightwing as I liked that its not your standard shower gel just with a festive scent - it's more of a shower luxury! But when I spoke the assistant more and gave Nightwing a smell, I was sold! Full of nourishing ingredients like Vitamin E and Lime oil, its great for the skin and the fruit pastille scent is completely addictive! The one negative I did find with this product is that some of the oils can leak out of the pot it comes in - and they are tinted with black/purple colourings, so things can get a little messy, but don't worry, it doesn't stain at all! That's picky, I know, but its just to warn you to store this properly if you get one for yourself. Usually the LUSH shower jelly's don't come shaped but Nightwing comes in an adorable bat design, so when you open the little pot you will find it all curled up inside. You can just pull it out and it'll unfurl easily. I had never used a shower jelly before but they are super easy. You can break off small pieces or use the whole thing, and you simply lather it up and rub it over the skin. As with all LUSH products, the fragrance is strong, but delicious and it'll leave your skin feeling super moisturised and nourished. This has lasted me ages so far and everytime I use it the bathroom just smells amazing - you can even use it on your hair too, but I am yet to try that! Overall, a good buy at £3.95, and for a seasonal product I'm really impressed with the design and scent! You can shop Nightwing and the other pieces in the LUSH Halloween collection on their website and instore right now! 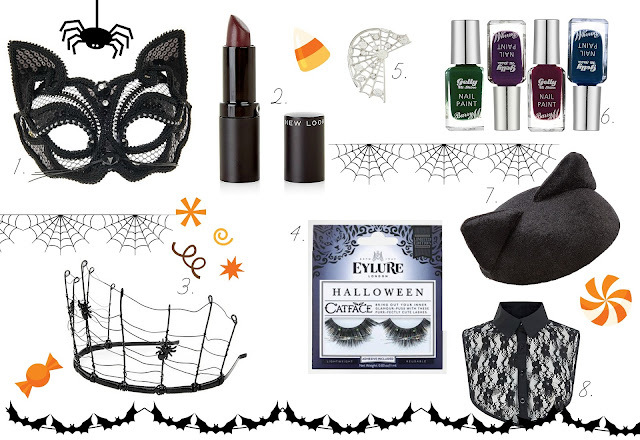 Have you tried any of the LUSH Halloween collection yet? Halloween is only 18 days away and in an attempt to sort out my last minute costume I have been looking for some accessory picks. Accessories can really pull an outfit together and can even be perfect little touches for those who prefer not to dress up at Halloween. I'm usually really 'on it' with my Halloween costume; planning at least a few months in advance, but this year it has just been so hard to even think of Halloween. What with wedding planning, mothering, working and blogging I haven't really had 5 minutes to myself - but now that it's so close and our wedding is over I am really trying to knuckle down and sort out a costume - I just cant decide whether I want to go as a spider queen or a fortune teller. Either way these little accessories are super-cute and I hope that some of you might find them handy too! - This lace cat mask is so stunning, it's sort of a step up from the classic black cat costume and brings a touch of glamour to the look. I like the use of sequins and diamante to make it eye catching and the whiskers are perfect! - A seasonal lipstick is great thing to have whether you are dressing up or not and I think this deep plum shade is dreamy. It'll look great as part of a vampy costume or just rocking your own signature style with a Halloween twist. - It's actually this gorgeous spider web tiara that bought my 'spider queen' costume to mind, it's elegant and different and, somehow, its pretty too. This could be used for a variety of costumes, which is really handy! - Lashes are always a go-to for any special occasion and these cat face ones from the Eylure Halloween collection are adorable! I'm not quite sure what they would look like on, but they certainly bring a fun twist to any look! - The ultimate glam Halloween accessory, this spiderweb ear cuff is so gorgeous. It's spooky enough to be part of a costume but isn't tacky like a lot of Halloween jewellery you see about. I also think it is a good price, considering it is from Accessorize! - Ah, Barry M. Always good for new releases, they haven't disappointed with their Halloween offerings. 4 new shade choices of Gelly nail paint - 'Black currant', 'Black Pistachio', 'Black Grape' and 'Black Cherry' - will ensure there is a polish to complete any costume. - And how about adding some mystery to your costume with this lace collar bib? It'll look amazing glammed up with a necklace or chain and will really give your costume a pop! I hope you have found this little guide useful - there are plenty of Halloween picks about this year, I am actually very impressed! What will you be dressing as this Halloween? Christmas is well on the way, and the stores and websites are filling up with festive goodies! After seeing the gorgeous Hayley's advent calendar wishlist on her blog, I just couldn't wait to make my own - there are so many out there and some might even surprise you! I love to have pretty nails during party season, and this gorgeous Ciate advent calendar can guarantee you'll have a fresh paint every day! It contains 18 different coloured polishes as well as nail treatments and a nail file. This calendar is kind of pricey but I love the Ciate polishes - the are hardwearing and the colour range is fantastic. The Body Shop is offering 2 different calendars this year to suit all 'budgets' .. although I don't think either of them are really in my price range its nice to dream! The standard version will be green and include lots of mini products while the Luxury version will set you back £80 but will also include some full size goodies. Each calendar will have offerings from the Body Shops Skincare, Bath and Body, Makeup & Fragrance ranges so you are bound to get something you like or discover old favourites! Probably the calendar that I am wishing for the most! 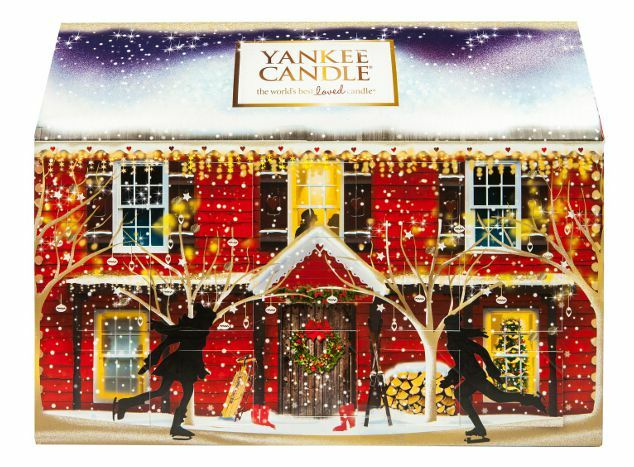 The 2015 Yankee Candle Calendar comes in this darling little house design and includes seven seasonal scents in tealight candle form - 'Bundle Up', 'Candy Cane Lane','Icicles', ' Spiced Orange', 'Snowflake Cookie', 'Winter Glow' and 'Christmas Eve'. There is even a special treat on Christmas eve included too! I am addicted to Yankee Candle and I think this would be a great way to get into the festive spirit! I haven't used lots of MakeUp Revolution products but the ones I have, have really impressed me so I think this calendar is a great way to try out more of their range - and each window contains a full size product so you really do get a lot for your money, plus you even get a special gift on Christmas day! How exciting! I'm not sure I like the the packaging all that much as its not overly festive, but it is in keeping with the Makeup Revolution product packaging so I suppose it is well thought out really! Available now on Superdrug website. This is more for Dan than for me! I usually buy him a box of the Hotel Chocolat milk chocolate penguins at Christmas but now I know that they do advent calendars I think I will get this for him instead!You can choose between a milk, white or dark chocolate calendar and each one includes 24 Christmas shaped chocolates including reindeer, snowman and penguins amongst others! Which Advent Calendar do you hope to get this year?